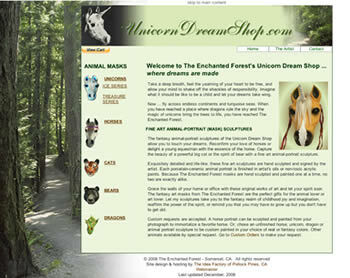 UnicornDreamShop.com is home to the animal portrait sculptures (animal masks) created by Sandra Stedronsky in her El Dorado County business, The Enchanted Forest. She wanted a website that could feature animal sculptures she has already finished as well as providing a place where visitors could request and purchase items of their own choosing. And since she shows her sculptures at galleries and arts and craft shows, she also wanted a business card that would have the flavor of the website to hand out at these events. Your business can express its personality too! Contact us. UPDATE: This business was a casualty of the poor economy and is no longer online.